The earliest remains of bow and arrow usage can be found in Europe, though there are possible fragments that were found in Germany dated 17,500 to 18,000 years old. 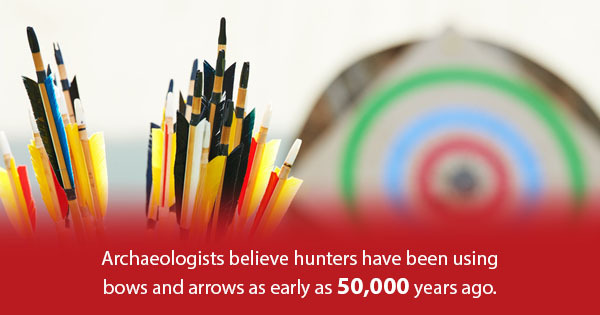 However, archaeologists believe hunters have been using bows and arrows as early as 50,000 years ago. Bows and arrows have been important for both hunting purposes and warfare. From prehistoric times until the widespread use of gunpowder in the 16th century, bow and arrows were the main instruments used during battle. Additionally, across Europe, though organized warfare with bows ended in the mid 17th century, it persisted into the early 19th century for tribal warfare in the New World. Indigenous people used these weapons for battle in every part of the world except for Australia. Also, in addition to hunting and warfare, bows and arrows were used for sport in ancient cultures of India, China, and Egypt. These bows were originally made of bamboo and other types of wood, and the bowstrings were constructed of animal gut. Asian and Native American bowmakers started gluing animal tendon to the back of the bow for a more complete design. Composite bows, which are made of three or more layers of dissimilar substances, were invented by several cultures across Asia as much as 4,500 years ago. Arrows began being tipped with arrowheads shaped from bone, horn, flint, bronze, and -- eventually -- steel and iron. For decades, archery was extremely dangerous but is actually quite safe today. In fact, according to recent National Safety Council statistics, archery is more than three times safer than golf, which just one injury for every 2,000 participants. Today, bow trainers equipped with archery apps allow anyone to work on their shooting accuracy and archery skills from the comfort of their own home. If you want to check out some high-quality bow trainers and some innovative archery training devices, contact AccuBow today.